Paso’s annual Pancake Brunch is Sunday, April 28th, 2019 at St. Paul’s Centre. Join us for pancakes, sausages and maple syrup at 12 noon. Donations will be accepted for the brunch. There will be a brief presentation of the 2109 Trip to Guatemala. Many new pieces of pottery, wooden items, textiles and artwork will also be available for purchase. All of the items were produced in Guatemala and brought back by Paso members to assist with fundraising efforts. Paso members will also be taking orders for its Annual Plant Sale. There will be a large selection of geraniums and begonias available. The plants will be available on May 17th and orders must be placed no later than May 9th. Paso’s Perennial Plant Sale will be held on Saturday, May 25th, 2019 at 136 Peter Street North. Paso Por Paso will be at the Orillia Farmers’ Market on Saturday April 20th. There will be an excellent selection of Guatemalan crafts which have been brought back after the February visit. A very large selection of textiles, pottery, wooden products and various other items will be available at excellent prices. Drop by the Library between 7:30 and 12:30 and support Paso’s activities in Guatemala. Sunday April 28th is the date for the Pancake brunch at St. Paul’s Centre. All are welcome to attend this event starting at 12 noon. Crafts will also be available at the sale. The Annual plant sale of Geraniums and Begonias is on now. Pick up is scheduled for Friday May 17th. The PERENNIAL plant sale takes place on Saturday May 25th. Guatemalan crafts will also be available at both of these sales. Paso’s AGM will be held on June 9th starting at 12 noon at St. Paul’s Centre. The public is welcome to attend. CMS students with Linda McDowell, Doris Middleton and Fred Fallis. Dale Duncan with a microloan recipient. Faye and Bob Goodwin with thier sponsored student. 2019 marked the 13th year of Paso working to alleviate poverty in Guatemala particularly in the chosen area of Panajachel and Tierra Linda. They are in the Lake Atitlan region, about a 3 hour drive west of Guatemala City. In February, nine Paso Board Members headed to Panajachel accompanied by eight friends and supporters. On the first full day, we met with the sponsored students for a valentine making session. Each student made a valentine for his or her sponsor and received several photographs which were taken during last year’s visit. The students were also provided with new shoes for the school year and received a variety of food items for the family. On Valentine’s Day, we attended a presentation at the Tierra Linda School. The new roof financed last year by Paso Por Paso allowed it to double as a wonderful open air auditorium space. The students were anxious to present lively and very traditional dance, poetry and storytelling performances for the Paso members. One of the most profound and enjoyable aspects of our time in Guatemala is when we are welcomed into our student’s homes in Panajachel, Tierra Linda, San Jorge and San Antonio. Some of those homes were a real climb but it was rewarding to see the extent to which the students and their families appreciated our interest and our presence. Saturday afternoon was spent with the past and present Canada Mayan Scholarship recipients at a local restaurant. Paso sponsors students to attend university. There are two students currently obtaining their degrees in teaching and nursing. During the second week, we presented 55 women with microloans. They have a variety of businesses for which they need the monies. These range from growing onions and vegetables to raising chicken for market or eggs, to weaving, beading, embroidery, running shops and making and selling tortillas. The Paso members also had an opportunity to visit with some of the women in order to learn more about their businesses and the impact it is having on their lives. Fundraising is necessary to finance all of the activities Paso is involved with. The next fundraising event will be a craft sale at the Orillia Farmers Market on Saturday April 20th. Paso members bring back a very wide variety Guatemalan crafts which are sold in the local area. Crafts will also be available at the annual Pancake Brunch at St. Paul’s Centre on Sunday April 28th. All are welcome to attend. The Annual plant sale and the Perennial plant sale are also happening in May. Check our blog or Facebook page for more details. Visit our website at www.pasoporpaso.ca for more information about Paso. Access to our blog can be made from the home page. 4 Paso directors and guests returned to Warminster Elementary School to view photographs and video from the 2019 Guatemala trip and to thank the school for producing a video for the Tierra Linda School. Johanna Fell produced the presentation and discussed it with the students. Doris Middleton, Marj Tomlin and Garry Fell also contributed explanations of the photographs. Melissa Sheridan’s class and Gerry Stockdale’s class attended the presentation. The Warminster school sponsors Lidia so that she can attend school. They raise the money through the sale of candy grams. Gerry Stockdale’s grade 7-8 class produced a video which was delivered to the Tierra Linda school. The school recently received a projector from Paso Por Paso to use in the classroom. They are still waiting to learn how to use it and we anxiously await their reaction to the totally different lifestyle in Warminster. Paso extends a very special thanks to Gerry Stockdale and his class. MARCH 14 – 17 from 10 to 4 Daily. 53 Westmount Drive north, Orillia. This week is our annual sale of Handcrafted goods and art brought back from our recent trip to Guatemala. There’s something for everyone at this sale. We offer a wide variety of household items, things for the kiddies, many accessories and also some artwork by young people from the Lake Atitlan area. Many items have been handcrafted with care by our own microloan recipients. A colourful feast for your eyes!! Treat yourself or buy someone a lovely gift. Cash, cheque or major credit cards accepted. The next sales will be at the Orillia Farmer’s Market on Saturday April 20th from 7:30 to 12:30 pm. and then at the annual pancake brunch on Sunday April 28th starting at 12 noon. April 28 is the date for the PANCAKE BRUNCH at St. Paul’s Centre. Everyone is welcome to attend this event which will start at 12 noon. Donations will be accepted for the brunch which will consist of pancakes, sausages and maple syrup. A brief summary of the 2019 trip to Guatemala will be provided. Lots of NEW Guatemalan crafts will also be available. The ANNUAL PLANT sale of Geraniums and Fibrous Begonias will be held again this spring. Orders must be placed with Paso Directors and other sellers by May 9th for delivery on May 17th. Bradford Greenhouse will again provide the excellent quality flowers. Paso’s PERENNIAL PLANT sale will be held on Saturday May 25th at 136 Peter Street N. for 8 am to 12 noon. Lots of top quality hardy perennials will be available. If you have plants which need dividing, Paso members can help you while you support our fundraising efforts. The AGM, ANNUAL GENERAL MEETING, will be held at St. Paul’s Centre on June 9th. Plan to attend to learn about the impact Paso Por Paso is having on the Mayan people in the Lake Atitlan area. The meeting will start at 12 noon. Warminster Elementary School presented Paso Por Paso with a cheque for the sponsorship of their student in Guatemala. Lidia lives in San Jorge La Laguna, is 11 years old and in grade 5. Lidia has 7 siblings and lives with her parents. She has been sponsored by Paso and Warminster since 2012. Paso directors presented a slide presentation illustrating Lidia’s life and compared it to the lives lived by the Warminster students. Paso directors and friend will have an opportunity to meet with Lidia again when they visit with her this month on their annual trip to Guatemala. Lidia will make a valentine for Warminster students when she comes to Panajachel with the other sponsored students and will also be visited in her home several days later. Paso directors will also spend some time visiting the Tierra Linda school, the 37 sponsored students, the sponsored university students and the 57 microloan recipients. 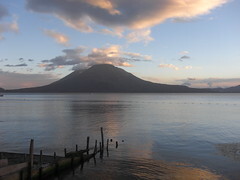 17 Paso directors and friends will spend several weeks in the Lake Atitlan area around Panajachel. Stay tuned for trip updates here and on our blog. St. Andrew’s Presbyterian Church held a Pork Roast dinner recently for their congregation and they invited Paso Por Paso to share their work with women and children in Guatemala. Bob Goodwin, both a director of Paso Por Paso and a member of St. Andrew’s, was instrumental in organizing this event. Paso Por Paso is a registered non-profit organization which was originated twelve years ago by eight retired high school teachers from Orillia. Their focus is on access to education through the sponsorship of students from primary to university. Paso has also made many improvements to the Mayan village school of Tierra Linda and they support a local school nutrition program. In addition, they support Mayan women through interest free micro loans used to start small businesses; this project raises the esteem of the women and their families. Bob Goodwin also presented on Sunday to the congregation. As a result, seven members of the congregation presented Mr. Goodwin with cheques to provide three year sponsorships for six students. This has allowed Paso to increase the sponsorship of students in Panajachel and in the remote highland school of Tierra Linda. Through the sale of Guatemalan crafts and a very generous donation, Paso was able to raise additional funds to support their initiatives in Guatemala. Two of the new sponsors will be joining Paso directors when they travel to Guatemala in February 2018. While there, they will have the opportunity to meet their sponsored students on two occasions. The first will be when each sponsored student comes to the Mayan Families office in Panajachel to make a Valentine’s Day card for their sponsor and to receive 60 pounds of food to take home. The second will be during a home visit to meet the family. This is always a special time for the family and sponsor as they have an opportunity to discuss the educational goals of the sponsored student and well as the needs and challenges they face on a daily basis. For more information about Paso Por Paso and to follow their activities while in Guatemala, visit our blog: pasoporpaso.wordpress.com. Information is also available on the website, pasoporpaso.ca and on the Facebook group, Paso Por Paso Orillia.